It’s never too late to start something new and for Desiree Heckman, owner of Old Town Yoga, it certainly paid off. Heckman, a Fresno State graduate with a Master’s degree in counseling, was a college advisor before taking some time off to spend with her children. After the birth of her son, Heckman became interested in yoga and began taking online classes to help get her in shape. After the birth of her second child, she became determined to become a certified yoga instructor, and soon began her training to begin teaching. She said she was never the athletic type, never did gymnastics, and was no success at all the sports she tried out for in high school. Heckman fell in love with yoga, and just couldn’t stay away. She started teaching free yoga classes at the park, she held private yoga classes to business employees, and even had a short stint teaching at GB3 before deciding it was time to start looking for a place solely dedicated to yoga. Her husband Andy, a talented artist, helped create the graphic art for the logo, the business cards, and all the renovations needed to make the place become a yoga studio. “It seemed like both of our talents came together to create this amazing project, it was the biggest DIY project and we were on a tight budget, but we didn’t have to take out a loan or anything like that,” said Heckman. 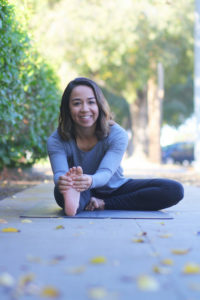 After advertising and promoting her business on social media, Heckman bonded with fellow yoga instructor Crystal Uyeno, and together they began to teach classes throughout the week. Heckman has been so busy since the opening in December that she has had to look to hire new yoga instructors for the coming month. With the rapid-fire success Heckman has been having, she hopes people continue to come and participate in her classes, and make Old Town Yoga a place where anybody can come in and feel welcomed.